Don't believe everything you read in the paper, they say. Once again, they're right. My grandaunt Jeanne gave me this newspaper clipping when I saw her at a family reunion on May 27th in Albany, New York. I gasped, as anyone would, when I read it. 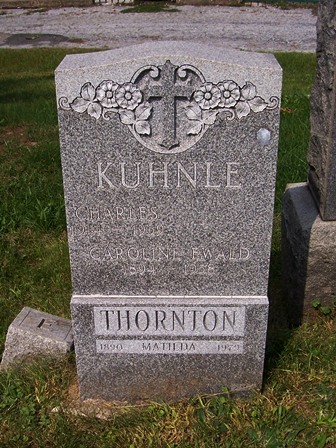 I'd been to the Burger/Ewald burial plot at Lutheran All Faiths Cemetery in 2008. When I took the photograph below of the headstone marking the spot where Caroline Ewald Kuhnle had been buried in 1958, I'd had no idea how she died. "It was a mercy killing," said Aunt Jeanne. "She had cancer, and she was dying. She asked him to do it because she couldn't stand suffering any more." That's an important piece of information. Without it, Frank Shannon looks like a cold-blooded killer, a domestic abuser who finally took matters too far, as so many do. With the information, however, a complicated drama begins to form in one's mind. How did Caroline ask him to do this for her? How long did they discuss this before Frank felt compelled to comply? How badly had Caroline deteriorated that Frank finally agreed that all of the horrors attached to stabbing her to death would be better than allowing her to continue suffering? There was a lesson for me here about not jumping to conclusions based on newspaper articles. Have you ever drawn a conclusion based on your research, only to later find out that conclusion was wrong? If so, I'd love to hear about it in the comments section below.